In the past, fingerprints on fabric have been very difficult to visualise due to the porous nature of the surface, especially to a quality that would be required if presented as evidence in court. Physical development methods do not work with porous surfaces, so chemical methods have been used with fabrics. Examples of chemical methods used for fingerprints of fabrics include iodine fuming, 1,2 Indanedione and ninhydrin. In a fuming chamber, solid iodine is heated up until it sublimates creating vapours which stick to the oily residues of prints, producing a brown colour. Unfortunately, this type of enhancement does not last very long, so should be photographed quickly. Safety concerns raised by this method include that the fumes are toxic and corrosive and should not be inhaled as this can cause serious health problems. Fabrics can be sprayed, dipped into, or washed with this reagent. It is sensitive to amino acids left in sweat by contact with the fabric, similar to DFO, and the reaction means ridge detail fluoresces yellow. Visualisation is then done with orange/red filters. This reagent can be irritant so should not be allowed to come into contact with skin. This technique is very common for locating latent prints. It is applied via spraying or dipping and also works with the amino acids, but the reaction is very slow. It is catalysed by heat and humidity, allowing development of the Ruhemann’s Purple dye complex. Ninhydrin is also irritant so should similar precautions should be followed. More detail on use of Ninhydrin in forensics can be found on the EVISCAN website here. More recently, fingerprints have been the subject of many experimental techniques due to the limitations of the above techniques. 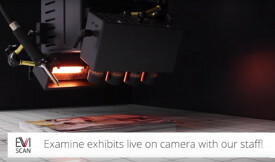 Newer techniques that have proven effective specifically for fabrics include vacuum metal deposition and cyanoacrylate fuming with infrared spectral mapping. First investigated in 2011, this techniques places fabrics in a vacuum chamber where gold is heated up until it evaporates and spreads finely over it. Zinc is then heated causing it to adhere to the gold in the places where there are no fingerprint residues. The print ridges are seen as the fabric, while the background is the metal. Read more about other uses of vacuum metal deposition here. A paper summarising this technique was first published in 2016. The process involves the use of cyanoacrylate fuming followed by imaging with an infrared microscope. The process worked best with smoother, shinier fabrics such as polyester, but was less effective for latent marks on cotton based fabrics. EVISCAN technology searches and secures fingerprints rapidly, without chemicals or pre-treatments and is therefore non-invasive and safer than most standard techniques.